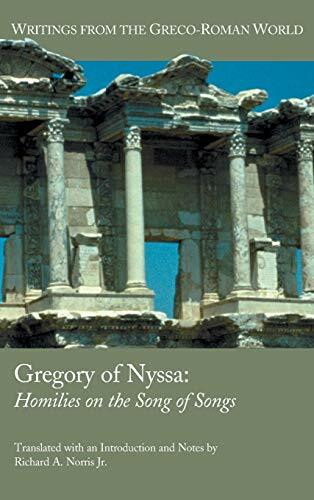 [PDF] Gregory of Nyssa: Homilies on the Song of Songs (Writings from the Greco-Roman World) | Free eBooks Download - EBOOKEE! Description: Richard A. Norris (19302005) was one of the great patristic scholars of modern times. Readers who wish to know more about Norris as a person, scholar, and theologian can gain valuable insights into him by reading the special issue of Anglican Th eological Review (90:3) that was published in honor of his numerous contributions (2008). He was especially interested in the history of biblical interpretation, and one of the texts to which he devoted particular attention was the Song of Songs. A highly infl uential patristic interpreter of this text was Gregory of Nyssa (ca. 335395 c.e. ), whose fi ft een homilies on the Song are translated by Norris in this volume. No comments for "[PDF] Gregory of Nyssa: Homilies on the Song of Songs (Writings from the Greco-Roman World)".